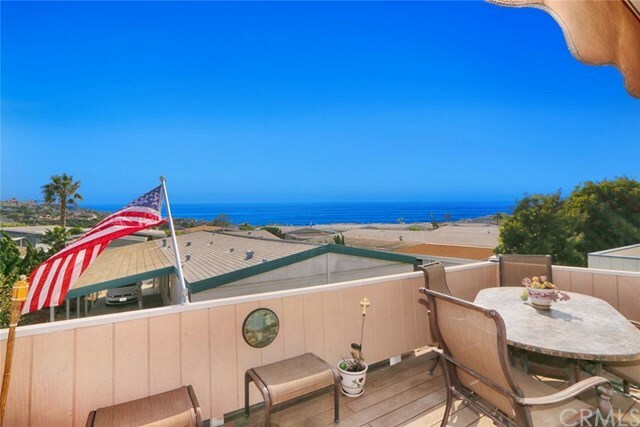 Located in the highly sought after Shorecliffs Terrace with an OCEAN VIEW and a 2 car garage!!! This home is one to see! Featuring approximately 1800 Sq Ft of Living Space. 2 Bedrooms & 1 1/2 bathrooms. The A/C, Heater and Water Heater are 3 years new. The toilets, bathroom cabinets with granite including sinks and faucets were installed in 2016. Situated with an Open floor plan, the Kitchen opens up to the dining room (Large Area) in which you will find a built in Hutch and newer laminate wood flooring. A Large Master Bedroom with 2 closets and bathroom with oversized tub. The 2nd bedroom has a ceiling fan and ample space. There is a Brick Patio area off the side of the home for relaxing, and a Large Deck with retractable awning and Trex Deck flooring to view the beautiful Sunsets. 2 Car Garage plus 1 car carport makes this large lot very desirable. Located on a Cul de Sac street with plenty of guest parking close! Fabulous Ocean Breeze! Shorecliffs Terrace is a 55+ Community (Spouse can be 45+) with Pool, Clubhouse, Sports Court and More. Pet Restrictions on number and size per HOA rules. Low HOA dues and NO SPACE RENT!